Mont Blanc is the highest mountain in the Alps and in Europe, its summit reaching 15,777 feet. The name has been derived from French and it means ‘White Mountain’. It has got this name due to the fact that the mountain is covered by snowfield and glaciers. This mountain is located between two countries Italy and France. Italian people call it Monte Bianco. It is quite difficult to define the exact height of Mont Blanc because it varies every year according to the height of its snow cap. The first recorded ascent of Mont Blanc was in August 1786 by Jacque Balmat and Michel Paccard. The first woman to reach the summit was Maris Paradis. She made the ascent in 1808. More than 20,000 climbers reach the summit of this mountain every year. In 1950 and 1966 two passenger airplanes have crashed on the mountain killing more than 160 passengers. The most popular climbing route taken by the climbers is the Voie des Cristalliers or Voie Royale. There is a 7 mile long tunnel traveling directly underneath the mountain. It links France and Italy. This mountain is ranked 11th in the world in topographic prominence. The lowest recorded temperature on Mont Blanc was -43°C set in January 1893. A small aircraft was landed on the summit in 1960 by pilot Henri Giraud which was only 30 meters long. Declan, Tobin. " 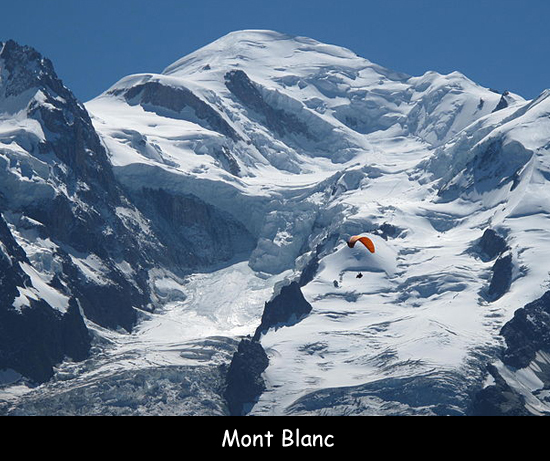 Fun Facts about Mont Blanc for Kids ." Easy Science for Kids, Apr 2019. Web. 26 Apr 2019. < https://easyscienceforkids.com/mont-blanc/ >.